Child custody cases are among the toughest cases to handle. Asset division and support cases involve accounting for the appropriate assets, income, and debts – and then assigning a value/sum that must be paid. Custody disputes go the heart of relationships. There’s no way to split a child in half. At every level, courts and parents are required to make judgments based on what is in the best interests of the children. The court considers many factors such as where the children already live, where they go to school, who can spend time with the child, the medical needs of the child, and many other factors. Child custody in Tennessee is divided into legal custody (who makes the key decisions for the child) and physical custody (where the child spends his/her days and nights). When does the child have a say in custody cases? Generally, judges will not listen to what children under six years of age have to say about which parent has legal or physical custody – unless there is an unusual situation such as when a child has been abused. A judge may want to speak with a child to confirm any disabilities. Judges may listen to children between six and 11 in some cases provided the child has something intelligent and useful to add to the custody decision – though usually judges won’t give the opinions of a child in this age range much if any weight unless there is some unique situation. Generally, judges must listen to children 12 years of age and older. In Tennessee though, the most weight is given to children who are 14 and older. The child’s opinion is just one factor of many. Many times, judges give older child’s preferences more weight because they understand older children are likely to just run away to the other parent’s home. The court wants to make sure a child is not pressured by one parent or the other. For this reason, if the judge permits a child to testify, the judge may appoint guardian ad litem to represent the child’s interests. The guardian helps understand the child’s desires and concerns. Usually, the judge will interview the child in his/her chambers instead of in open court before the public. The attorneys for the parents and the guardian may be present. Generally, the parents are not present in the judge’s chambers when the child is being questioned. 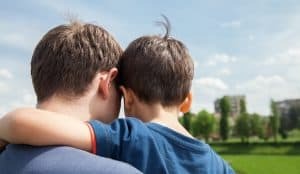 Custody cases require experienced family lawyers who understand how to balance litigating the dispute and using other less-contested ways to generate a solution. At the Law Offices of Adrian H. Altshuler & Associates, our family lawyers understand how to facilitate custody solutions including temporary custody orders until the custody issues are resolved. We also represent parents when agreements or court orders are being violated. For help with child custody, child support, and all divorce issues, please call us at 615.412.1121, or fill out our contact form to make an appointment. We help families in in Franklin, Columbia, Brentwood and nearby locations in Central Tennessee.